The following lists the discussion papers and final revised papers published within the last 60 days. Methane seepage from the seafloor west of Svalbard was investigated with fast-response membrane inlet laser spectrometer. The acquired data was in good agreement with traditional sparse discrete water sampling, subsequent Gas Chromatography, and with a new 2D model, based on echosounder data. However, the acquired high-resolution data revealed unprecedented details of the methane distribution, which highlights the need for such methods, for future climate studies. 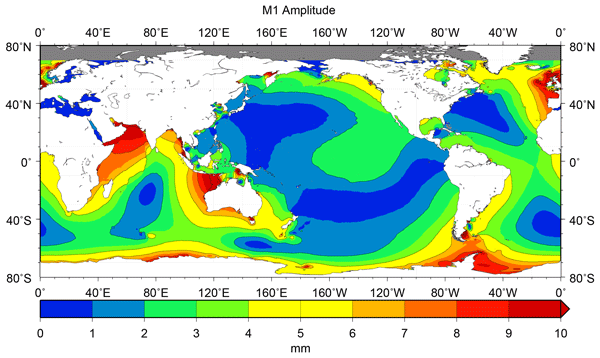 This is the first investigation of the worldwide distribution of the degree-3 M1 ocean tide using over 800 tide gauge records and a global tide model. M1 is confirmed to have a geographical variation in the Atlantic and other basins consistent with the suggestion of Platzman and Cartwright that M1 is generated through the spatial and temporal overlap of M1 in the tidal potential and one (or at least a small number of) diurnal ocean normal mode(s). Extreme water levels are often created by several drivers with different properties. For example, the contribution from the water volume of the Baltic Sea follows a Gaussian distribution but storm surges represent a Poisson process. We show that wave set-up heights (the third major component of high water levels) frequently match an inverse Gaussian distribution. Therefore, high set-up events may occur more frequently than it could be expected from the probability of occurrence of severe seas. Mesoscale eddies are large bodies of swirling water, which generally refer to ocean signals with spatial scales of tens to hundreds of kilometers and temporal scales of days to months. 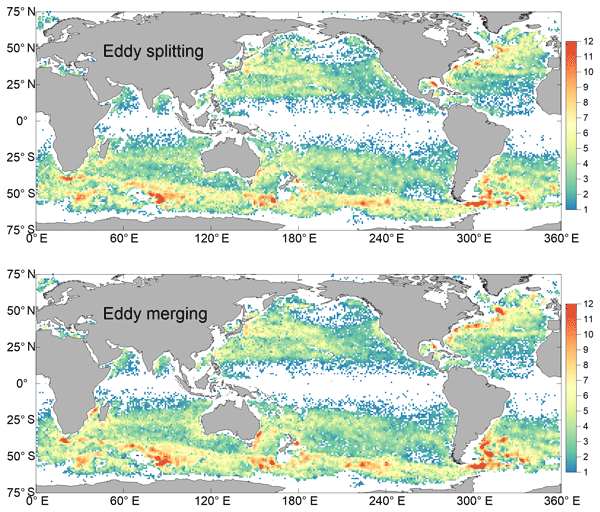 This study identified events of splitting and merging of mesoscale eddies in the global ocean based on sea level height data. Multicore structures represent an intermediate stage in the process of eddy evolution, similar to the generation of multiple nuclei in a cell as a preparatory phase for cell division. A novel predictive model is built for eddy propagation trajectory using the multiple linear regression method. This model relates various oceanic parameters to eddy propagation position changes in the northern South China Sea (NSCS). 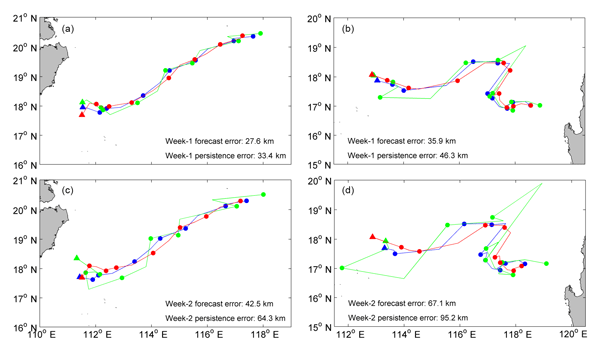 Its performance is examined in the NSCS based on five years of satellite altimeter data, and demonstrates its significant forecasting skills over a 4-week forecast window compared to the traditional persistence method. Two decades of observations of the Arctic Mediterranean (AM) exchanges show that the exchanges have been stable in terms of volume transport during a period when many other components of the global climate system have changed. The total AM import is found to be 9.1 Sv and has a seasonal variation in amplitude close to 1 Sv, and maximum import in October. Roughly one-third of the imported water leaves the AM as surface outflow. Sea surface temperature (SST) is related to ocean heat content, an important topic in the debate over global warming. In this paper, we propose a novel SST-predicting method based on the hybrid improved EMD algorithms and BP neural network method. SST prediction results based on the hybrid EEMD-BPNN and CEEMD-BPNN models are compared and discussed. A case study of SST in the North Pacific shows that the proposed hybrid CEEMD-BPNN model can effectively predict the time-series SST. In December 2002 and January 2003 satellite observations of Chlorophyll showed a wavelike pattern with a wavelength of about 750 km south west to the Cape Verde peninsula. Such a pattern suggests the existence of a locally generated Rossby wave which slowly propagated westward. To verify this hypothesis a numerical study based on a simple model has been conducted. The numerical results are completed by an analytical study which evaluates the potential impact of the coastline shape. 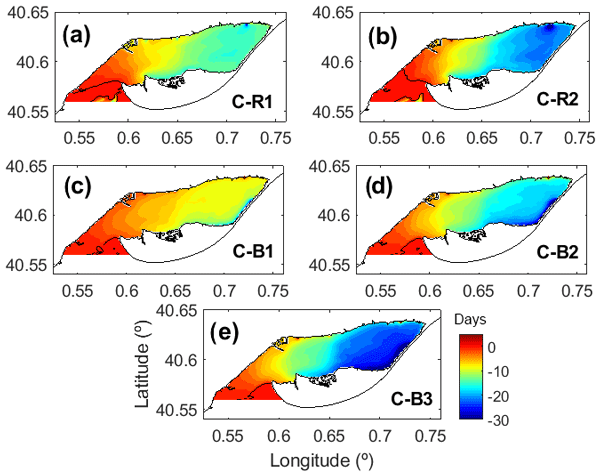 This work uses high-resolution global ocean model data to quantify the sinking of waters in the subpolar North Atlantic. The largest amount of sinking is found at the depth of maximum AMOC below the mixed layer depth, occurring mostly near the boundaries (90 %), in the first 300 km off the coast. However, the characteristics of the sinking (total amount, seasonal variability and vertical structure) varies largely according to the region considered, revealing a complex picture for sinking. The resonant period of the Gulf of Thailand is potentially close to 1 day. However, the classic quarter-wavelength resonant theory fails to give a diurnal resonant period. In this study, we first perform a series of numerical experiments showing that the resonance of the South China Sea body has a critical impact on the resonance of the gulf. 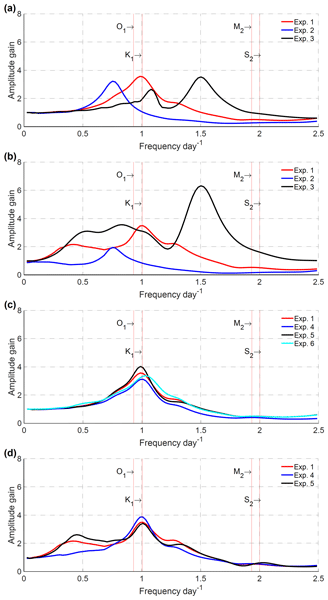 An idealised two-channel model that can reasonably explain the dynamics of the tidal resonance in the Gulf of Thailand is then established in this study. Waters form the Subtropical Water mass (SUW) generated in the central Atlantic enter the Caribbean through Antilles and flow westward at the depth of the subsurface salinity maximum. Our evidence shows that part of these waters are returned to the east by a Coastal Undercurrent where their salt content is modified by intense processes of vertical mixing with diluted surface waters. Eventually these modified SUW waters reaches the surface in the coastal upwelling areas off Colombia and Venezuela. In this paper we investigate the origin of the variability in near-bottom turbidity observations in Alfacs Bay (in the northwestern Mediterranean Sea). The observations of turbidity peaks are consistent with the seiche phenomenon. We suggest that the sequence of resuspension events plays an important role in the suspended sediment concentration, meaning that previous sediment resuspension events may influence the increase in suspended sediment in subsequent events. In operational oceanography, regional and local models use large-scale models (such as those run by CMEMS) for their initial and/or boundary conditions, but unfortunately there is no feedback that improves the large-scale models. The present study aims at replacing normal two-way nesting by a data assimilation technique. This upscaling method is tried out in the north-western Mediterranean Sea using the NEMO model and shows that the basin-scale model does indeed benefit from the nested model. We retrieved the major pigment concentrations of phytoplankton from satellite ocean color multi-spectral sensors in the Senegalo-Mauritanian upwelling, which is one of the most productive upwelling system with strong economic impacts on fisheries in Senegal and Mauritania. We processed the satellite data with a neural network classifier. This research was done through a fruitful cooperation between statisticians, specialists of neural Networks and oceanographers. Global circulation of intermediate water masses has been extensively studied; however, its regional and local circulation along continental margins and variability and implications on sea floor morphologies are still not well known. 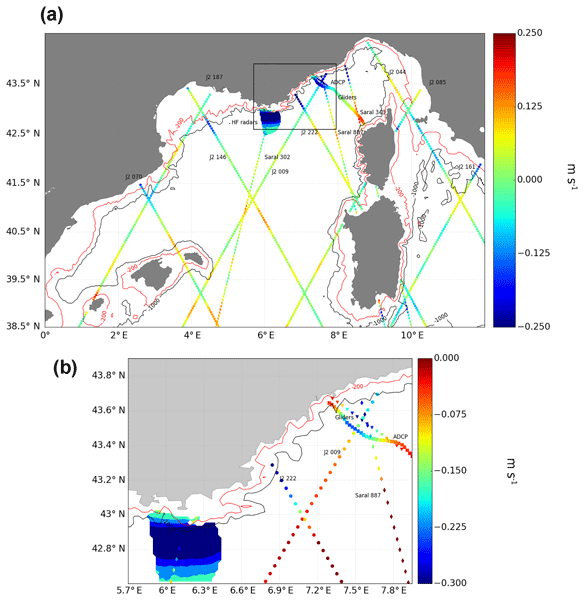 In this study the intermediate water mass variability in the Gulf of Cádiz and adjacent areas has been analysed and its implications discussed. 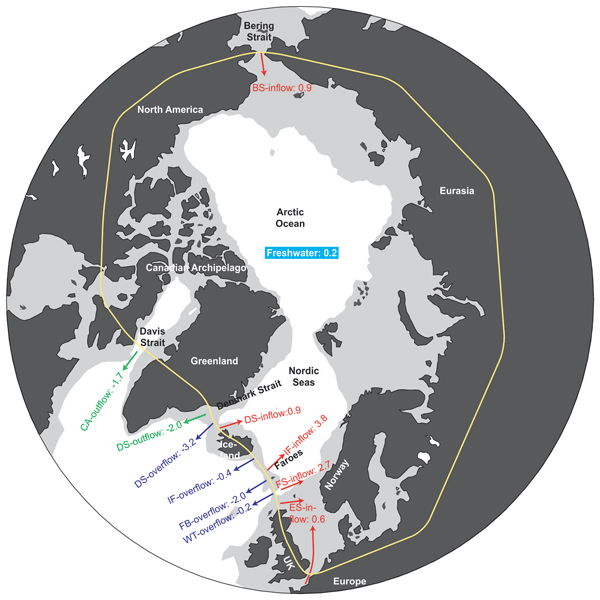 Remarkable seasonal variations of the Antarctic Intermediate Water and the Subarctic Intermediate Water are determined. The bottom topography of the Baltic Sea is analysed using the new digital depth model by the European Marine Observation and Data Network (EMODnet). Analyses include depth distribution versus area, water volume, and seafloor depth variation on a km-scale. The limits for the Baltic Sea and analysed sub-basins are from HELCOM. EMODnet is compared with the previously most widely used depth model and the area of deep water exchange between the Bothnian Sea and the Northern Baltic Proper is analysed. Errors of observations and numerical model data are analysed with a focus on heterogeneous coastal areas. An extension of the triple collocation method is proposed, which takes into account gradients in the collocation of datasets separated by distances which may not be acceptable for a nearest-neigbour approximation, but still be feasible for linear or higher order interpolations. The technique is applied to wave height data from in situ stations, models, and the Sentinel-3A altimeter. The Persian Gulf Water and Red Sea Water are salty and dense waters recirculating in the Gulf of Oman and the Gulf of Aden, in the form of small features. We study the life cycle of intense and small vortices and, their impact on the spread of Persian Gulf Water and Red Sea Water by using idealized numerical simulations. Small vortices are generated along the continental slopes, drift away, merge and form larger vortices. They can travel across domain and participate to the tracer diffusion. 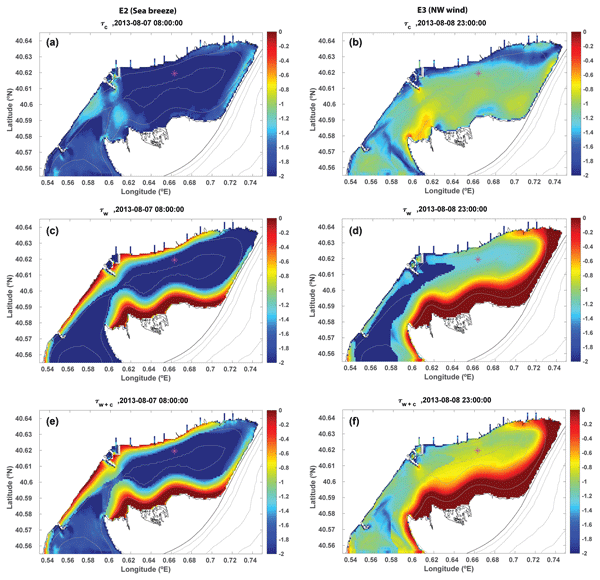 Here we investigate the occurrence of extreme storm surges in the southern German Bight and their associated large-scale forcing mechanisms using climate model simulations covering the last 1000 years. We find that extreme storm surges are characterized by a large internal variability that masks potential links to external climate forcing or background sea level fluctuations; existing estimates of extreme sea levels based on short data records thus fail to account for their full variability. 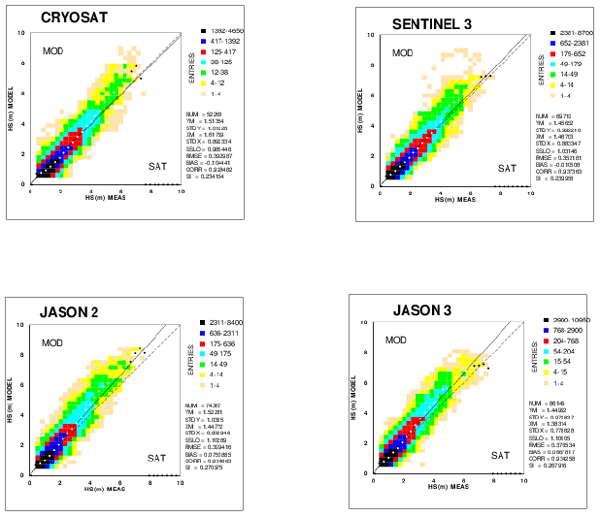 We carry out an inter-comparison of four different altimeters: Cryosat, Jason-2, Jason-3, and Sentinel-3. This is undertaken by checking the altimeter data against wind and wave model results for a given area, in this case the Mediterranean Sea, over 1 year. The four data sets are consistent for wind speed, but they show substantial differences for wave heights. The verification of a Sentinel-3 pass close to the coast in the northern Adriatic Sea shows irregular, spiky, large wave height values. 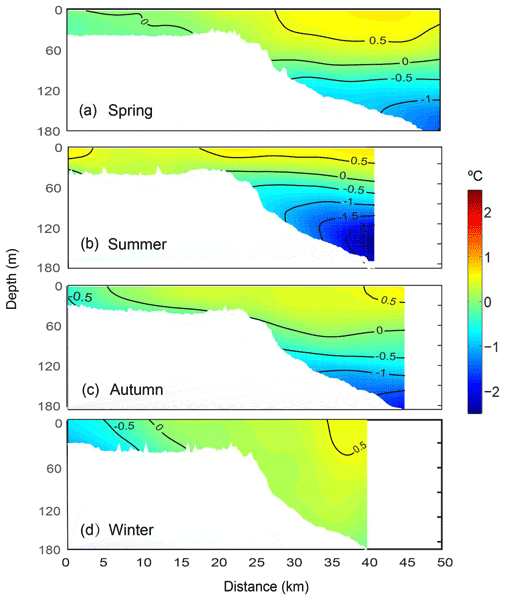 Observations of ocean currents at two depths within the first meter of the surface are made using a large number of ocean drifters of two different draft depths (0–5 cm and 0–60 cm). We deconstruct the surface velocity measured by the drifters to calculate a purely wind-driven current in the two layers measured. 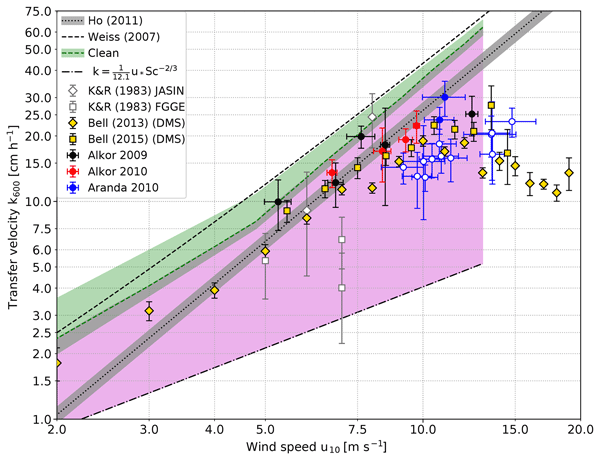 We find significant velocity differences in the calculated wind-driven current between the sampled depths, which could have large implications for forecasting ocean surface transport. Internal tides are subsurface waves generated by tidal flows over ocean ridges. When they break they create turbulence that drives an upward flux of nutrients from the deep ocean to the nutrient-poor photic zone. Measuring internal tides is problematic because oceanographic moorings are often fished-out by commercial trawlers. We show that autonomous ocean gliders and acoustic Doppler current profilers can be used together to accurately measure the amount of energy carried by internal tides. 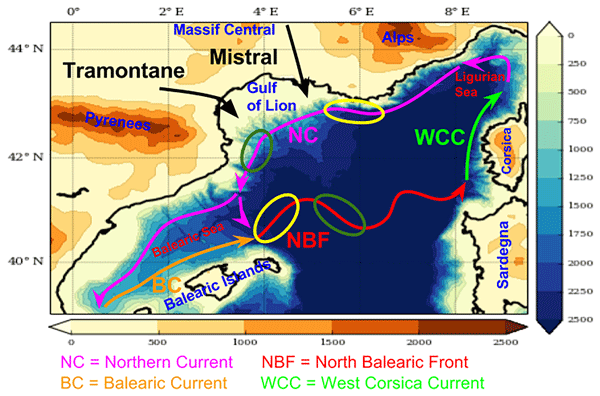 In this contribution we investigate the hydrodynamic response in Alfacs Bay (Delta Ebro, NW Mediterranean Sea) to freshwater flows and inner bay to open sea connections. The numerical model ROMS is applied nested to Copernicus models and validated with in situ data. Considering the results, only the modification of freshwater flows is recommended due to its lower impact on the environment and associated economic costs. None of the proposed solutions solve the problem related to warm waters. We here present our efforts to develop a model for the Galveston Bay (besides Houston, Texas), whose hydrodynamic condition is sensitive to the adjacent Texas-Louisiana shelf condition. The model is well configured and accurate in reproducing the hydrodynamics conditions inside the bay and over the shelf. Including the broad shelf allows us to easily take into account the profound influences from major neighboring rivers, such as the Mississippi-Atchafalaya rivers. Earth observation satellites routinely monitor sea-surface temperature. However, they require in situ references for calibration and validation. To support this step, drifting buoys carrying sensors with improved calibration were deployed. This paper finds that sea state and immersion depth are important to better understand the buoy measurements. 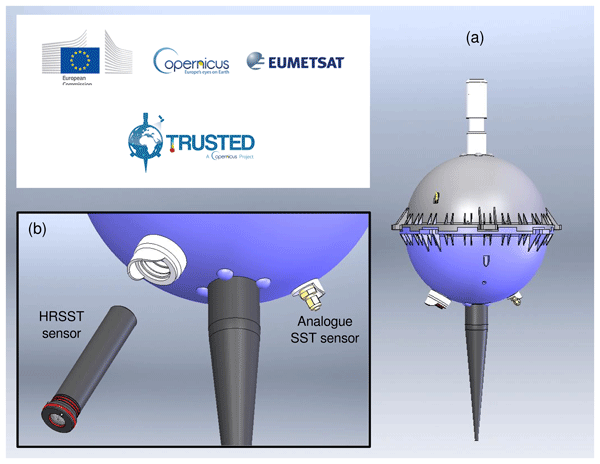 A new drifting buoy was designed as a result, in the framework of the European Union Copernicus program, with an accuracy found to be within 0.01 °C. The ocean emits the gases carbonyl sulfide (OCS) and carbon disulfide (CS2), which affect our climate. The goal of this study was to quantify at which rates both gases are produced in the Eastern Tropical South Pacific (ETSP), one of the most productive oceanic regions worldwide. Both gases are produced by reactions triggered by sunlight, but we found that the amount produced depends on different factors. Our results improve numerical models to predict oceanic concentrations of both gases. Mesoscale eddies are ubiquitous swirling flow patterns in the open ocean with diameters of around 100 km. They transport a huge amount of heat and material and are therefore key elements of the weather of the ocean. Using satellite-based ocean surface elevation, we found that the combined global effect of all mesoscale eddies can be treated as a single strong super-vortex . This finding can be helpful to estimate the energy budget of ocean regions where only sparse field data is available. 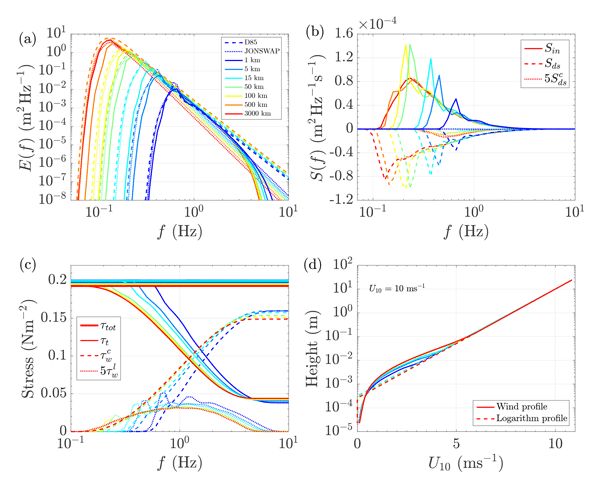 This paper highlight the adjustment of the wave physics in order to improve the surface stress and thus the ocean/wave coupling dedicated to Iberian Biscay and Ireland domain. The validation with altimeters wave data during the year 2014 has shown a slight improvement of the significant wave height. Statistical analysis of the results of the new and old versions of the wave model MFWAM is examined for the three main ocean regions of the IBI domain. Connections between Long Island Sound (LIS) water temperature variability and modes of tropical sea surface temperature (SST) variability have yet to be explored. 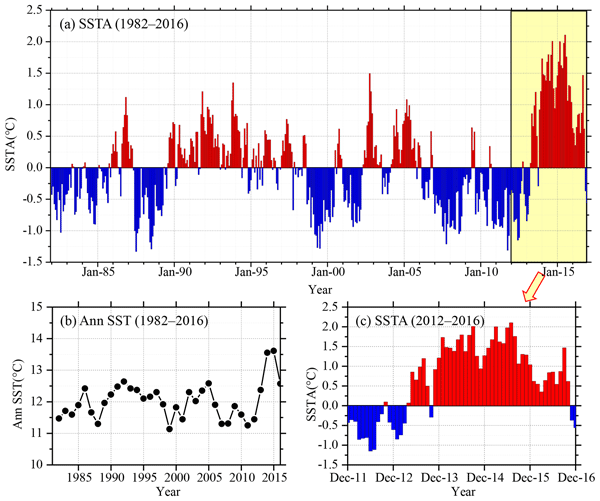 It is shown that intense LIS cold-water temperature events are related to central equatorial Pacific SSTs. The decay phase of such events may be related to canonical El Niño events. 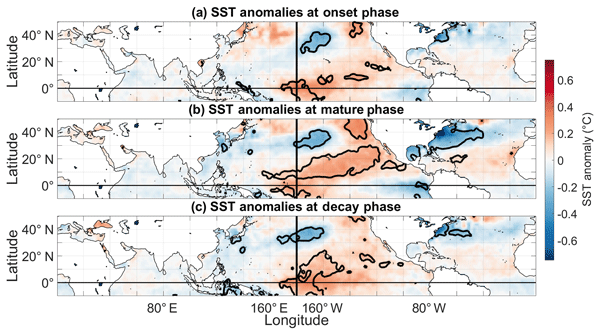 Furthermore, a ridge–trough atmospheric pattern related to LIS water temperature variability fluctuates coherently with central equatorial Pacific SSTs. In the North Atlantic, ocean currents transport warm waters northward in the upper water column, and cold waters southwards at depth. This circulation, not easily measured in situ, is here obtained from surface data and thermodynamics theory. Its driving role in recent temperature changes (1993–2017) in the North Atlantic is evidenced, and predictions of near-future variability (5 years) are provided and discussed. In this paper we present a gas equilibrator that can be used to extract gases continuously or in discrete samples from seawater. The head space is analysed by a commercially available Proton Transfer Reaction - Mass Spectrometer. This allows measurement of a broad range of dissolved gases up to a very high solubility in seawater. The main advantage of this equilibrator lies in it's unique design and ease of reproducibility.